At 51, Salma Hayek’s beauty doesn’t fade. What is her secret? Well, throughout the years, the actress has accumulated a lot of tips. And she loves to share them, especially considering that she has her own line of cosmetics at CVS. 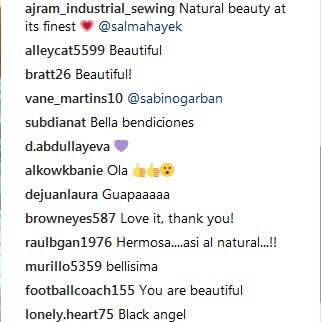 Salma is all for natural beauty. She is not one of those actresses and public people who like to get a little help from the plastic surgeons. The Mexican beauty doesn’t wash her face in the morning, she’s not trying to change her hair with the use of tools, and she swears by Tepezcohuite – an ingredient which is used to regenerate the skin. Recently, Hayek shared a stunning selfie with no makeup on, which took the breath of many fans away, including us! 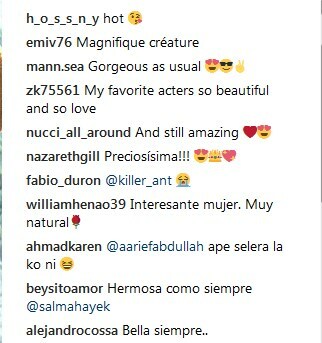 Salma, who will turn 52 on September 2, took to her Instagram account to share a snap wearing a gorgeous black bikini and absolutely zero makeup. The actress is currently enjoying some time off while she relaxes on vacation on some tropical island. Needless to say, her fans couldn’t stop praising the Hollywood star for her dreamy looks. Salma Hayek is one of the stars who proved that 50 is not the age to retire from wearing a biking, and rightly so!